A lecturer in history and social anthropology, S M Sigerson has been active in NGOs, community groups, and electoral politics, through life. Since the 1970s, the author has devoted on-going in-depth study to the subject of secretive interference in lawful political activity, including politically-motivated killings. Eleven years’ intensive research went into the preparation of this book, including first-hand acquaintance with places, people and culture connected with Collins' life and times. This is the first author to approach the enigma of Collins' fate, armed with this unique range of experience. 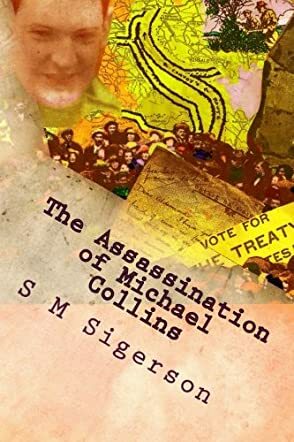 While a lover of history, anthropology, and criminalistics, the story of Michael Collins was one I was only vaguely acquainted with before reading SM Sigerson's The Assassination of Michael Collins. The book's description is what first caught my attention. I greatly enjoyed reading the book. I would offer a word of warning - this book follows a scholar's bent, and the language reflects that. If you are looking for something written more 'mainstream', this is probably not the book for you. However, if you enjoy scholarly books, this is a great read on a fascinating story. Sigerson provides insights and information on the time and the setting of the events in question, giving a reader new to the story a proper context and form of reference. I really liked the fact that the Kindle version I read had easy access to reference materials used by the author. I ended up adding a few more books to my 'to be read' pile. Criminal cases fascinate me. Sigerson lays out evidence, in context, to help try and make sense of this great mystery. He provides witness statements as well, but rather than forcing his own conclusion upon the events in question, Sigerson instead follows the evidence. This is still an unsolved case, but the work Sigerson has put into it helps make things a bit clearer. The Assassination of Michael Collins is definitely a must-read if you have any interest in this period of Irish history, or any interest in Collins himself. As mentioned before, this was all new to me, and Sigerson's work engaged my interest in this fascinating man and his life. I have definite plans to pursue the books recommended by Sigerson, and the ones used as resource materials.